Basic Pack contains 8 Kazoos. The Kazoobie Kazoo is the best plastic kazoo you can buy. They use the highest grade materials and every part of the process is "Made In The USA." Kazoobie's resonator material is very durable and the caps are pressed in using 100 lbs. of pressure. Kazoobie kazoos have been safety tested and are approved for children age three and up. 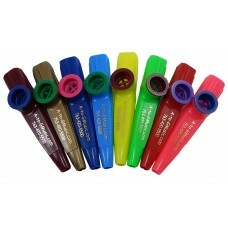 Colors will vary for Kazoos. "In my years of playing in a jug band, I've found it the only kazoo worth a toot. An added bonus, it's the only kazoo made in the U.S.A."
"These things were a fun stocking stuffer for Christmas morning. Some didn't know what they were, let alone which end to hum into. We got lots of laughs playing Christmas songs on them along with the slide whistle and jaw harp. An inexpensive fun item to enjoy with kids and family." "Best kazoos EVER! These have held up to my 3 year old's abuse and constant playing, so you know they're made to last."